Enjoy a fabulous evening of music at The Epstein Theatre when Wuthering Heights: The Music of Kate Bush comes to its stage on Tuesday 29 May. ‘Wuthering Heights’ the show, captures not only the magic of Kate Bush’s work from early albums such as the The Kick Inside right through to Ariel, but furthermore recreates the atmosphere and ethereal qualities which surround much of Kate's compositions. 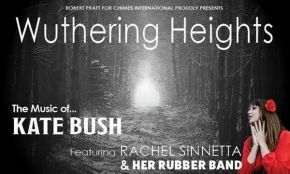 Featuring the exceptional vocal expression of Rachel Sinnetta, and supported by an incredible band of five talented multi instrumentalists, The Rubber Band, the show promises to be an evening celebrating the best of the star’s music. Kate Bush’s debut single Wuthering Heights topped UK charts for four weeks in 1978, making her the first ever female artist to achieve a UK number one with a self-written song. She has since released twenty-five UK Top 40 singles including, Running Up That Hill, The Man With The Child In His Eyes and Babooshka. Kate has also released a huge ten studio albums, all of which have reached the UK Top Ten, including three UK Number One albums. 2018 marks the 40th anniversary of the release of The Kick Inside, and this is the perfect show for all Kate Bush enthusiasts to celebrate the occasion. Wuthering Heights: The Music of Kate Bush is the ultimate salute to the widely respected and revered Kate Bush.